This is getting back to the promotional activities of a lot of folk in the beer industry (and beyond). Hi. I have a new mystery novel, where someone is killed in a brewery. Would you like to plug it? Our brewery has a new design profile, and we have just made some lovely t-shirts. Would you care to show the new design? 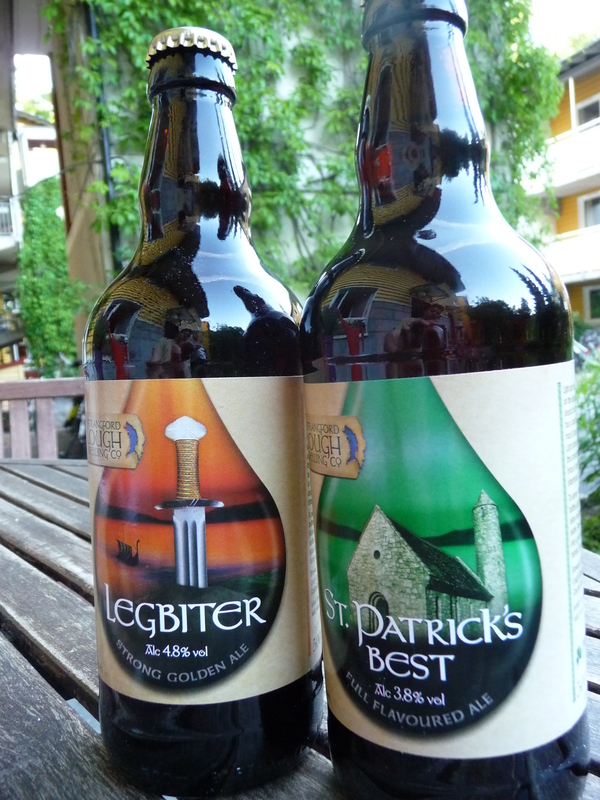 The good people at Strangford Lough sent me two bottles of beer instead. Which I can relate to. Looks like this is a flying or contact brewery, meaning that they get their beer brewed to spesifications at various spots around the globe. It is stated on the label that it is made somewhere in the E.U. Nothing wrong with contract brewing – Mikkeller does not have a brewery, remember. Still, I think it in everybodys interest to tell where beer is brewed, but in this instance they seem to find it more important to market romatic notions about the Northern Irish landscape. So – The Legbiter. A sturdy half liter bottle, pouring an amber ale into my glass. Mild carboanation, and a rather mild ale. Sweet malt, very British hoppiness, floral and herbal notes in the finish. A hint of yeast. I’m sure the Irish myths around this spins a tale, but there is not very much top distinguish this beer from hundreds of others. I would advice them to try for a signaturea ale with a more stand out character. But this is certainly drinkable. On a hot day in multiples. St. Patricks’s Best is a decent bitter. It has caramel, and there is a little yeast here, too. On the thin side, tones of cognac. Dry finish. Nice golden glow. An all right session beer, but not spectacular. I think this would be better on keg or cask than in bottled form – but that applies to most low alcohol beers from the UK. I had to deliver a few books at the Oslo municipal library today, and a magazine caught my eye. It is the periodical of the Oslo Municipal Archive, which has Food and drink as the theme of its latest issue. Of particular interest is an article about brewery history. Bård Alsvik chronicles the developement from the first brewing licence in 1776 and onwards. 100 years ago, there were 10 industrial breweries in Oslo, now there are none. A total of 37 breweries are listed within the current city borders. Sure, a crisp pilsener or a clean IPA is usually what you want when the summer really sets in. A hefeweissen, perhaps. No smoked bocks or chocolate overdosesAn alternative is to go for one of the classics. It does not come in champagne bottles like its upmarket siblings. You don’t have to go to a dingy back street bar and mumble a password to get it, either. In Brussels, you get a fourpack for 5 Euros or so. 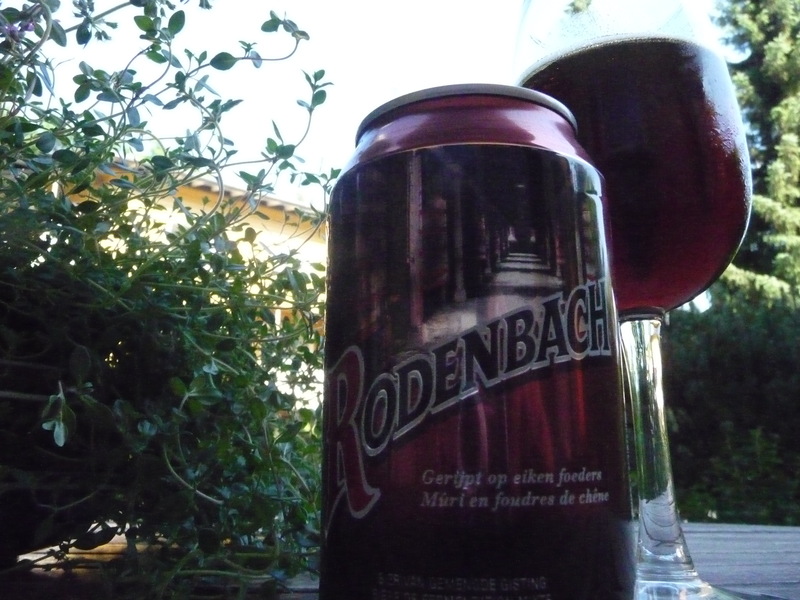 Canned Rodenbach. Sweet and sour. As refreshing as it gets. Who needs Campari? It takes place on 11 and 12 September at Bibbiano, Buonconvento, Siena. Amongst the sweet rolling hills of the Siennese countryside, rises the village of Bibbiano – not more than a couple of houses. It is in the direct neighbourhood of Buonconvento, in a valley that has been an ongoing inspiration for poets and painters. This year, however, it will not only be the enchanting landscape that will astonish the traveller, fortunate enough to pass by, but as much its inhabitants: brewmasters from Belgium and Italy that proudly will display their knowledge and products for him. Beerexperts and artists alike will transform the little hamlet into a lively Village of the Beer. The result will be an unforgettable trail, that will enable both the passionate as the curious, fortuitous amateur of beer to explore the traditional artisanal beers from Belgium, as well as from the vivacious Italian culture. The Village of the Beer will take place on September 11th and 12th 2010. After purchasing a token, one will be able to taste artisanal beers, try out dishes, based on beer, and compare one’s own impressions with those of experts in sensory workshops…. I should go to London more often. I should have been there today. I told you about the package from BrewDog that arrived the other week – but how were the beers? First of all, there were two bottles of the 5 A.M Saint. It was interesting to compare this with the locally available Alpha Dog, the profile is very similar with lots of fresh hops. Abstrakt AB:01 Hazy brown beer with lazy carbonation. It has a plastic “champagne” cork, not the real hing. With your inventive packaging for other beers, I know you can do better, boys. The Prototype 27 is really BrewDog at their best, a close relation to their Rake Raspberry Stout from a few years back, but this time using an IPA as the starting point. A glowing amber beer. Strong raspberry aroma, smoke and whisky palate. The smoke plays merrily around the berries, giving flavour you never believed you’d find in a beer. Not much of the IPA character left, but I don’t really miss that. I wonder how many failed attempts they have before they end up with a brilliant brew like this.